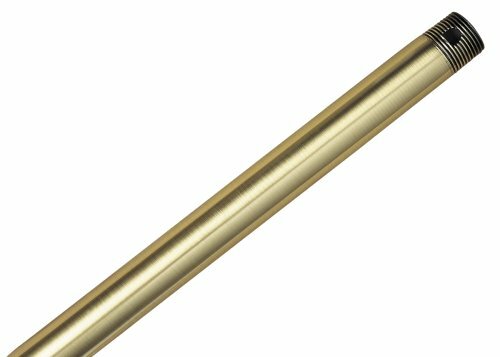 The Hunter 48-inch Original Extension Downrods are perfect for high and sloped ceilings. Ceiling height or slope makes little difference when using a Hunter extension to mount a high-quality ceiling fan. At 48", the downrod sets the fan at the proper height for optimum performance. Both ends have tapered single-thread construction for better hold when mounting the fan. Being made to fit Hunter fans, this extension is designed with modern style in mind and comes in multiple colors to match Hunter fans with the same finish. It is constructed from sturdy metal for durability and is appropriate for indoor use only. Available in Antique Brass, Antique Pewter, Black, Bronze Patina, Brushed Nickel, Chestnut Brown, Hunter Bright Brass, Iron, New Bronze, Provencal Gold, Weathered Brick, or White.